Was it luck, planning, perseverance or skill? I think this image was a collection of all of those things. I wanted to capture a storm over Sydney. I had tried on numerous occasions and never got anything I was happy with. This time It was different after lots of time spent planning and finding suitable venues I saw a front approaching on the BOM radar, I quickly moved to this location in Rose Bay which I knew would work. After getting soaked and looking like a bedraggled wet cat, I thought I had missed my opportunity as the lightning was dying down and I hadn't captured anything remarkable. Never give up until well after an event, this was one of those times I started to see the vivid sunset break through the clouds over the city. I started taking a series of images with exposures of around 8-15 seconds. The long exposures payed off and I caught the last lightning bolt over the city. 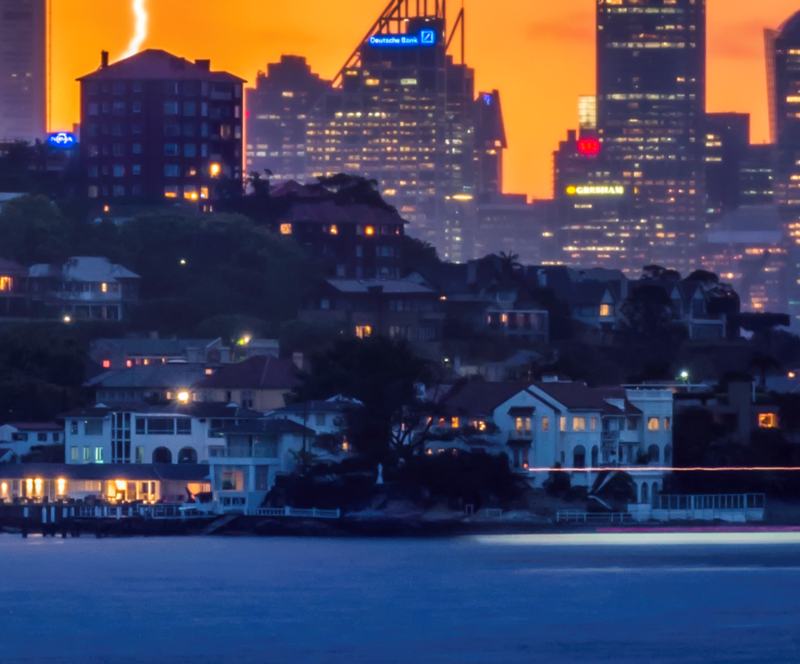 I also happened to capture one of Sydney's fast ferries off towards the city. This was the lucky part, being able to be in the right place at the right time is defiantly a mix of all of the above elements however this one definitely had a lot of luck. The image was captured on a Nikon D800E with a 85mm lens, 8 second exposure and F11. See the thumb nail below for a 100% crop at the houses in the foreground to give you an idea on full resolution.